Iris is a spectral energy distribution (SED) analysis tool that allows the astronomer to build, edit, visualize and model SEDs across a broad spectral range. Iris has undergone a round of plastic surgery, with a full overhaul on the Visualizer, Metadata Browser, and Fitting Tool. The Visualizer and Metadata Browser now use STILTS -- the same library that powers TOPCAT -- as their backend. 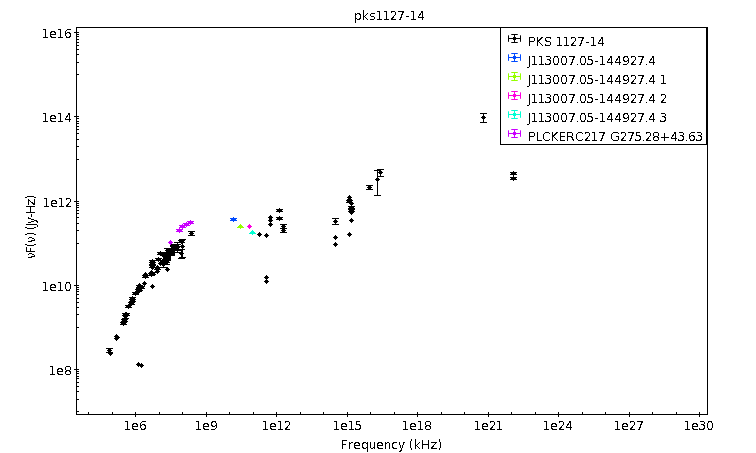 High-resoultion spectra can now be plotted. The Fitting Tool encapsulates the models, parameter values, fitting options, and fit statistics in one window. The changes to Iris 3.0 are mostly user-interface updates and bug fixes. The algorithms behind building, editing, and fitting SEDs remains the same unless otherwise noted. For a full list of the changes introduced in Iris 3.0, please see the Release Notes. Download Iris v3.0. Iris is a Virtual Observatory downloadable application for analysis of 1-D astronomical spectral energy distributions (SEDs). Iris allows the astronomer to build a SED of a source from multiple, separate data segments or photometric points, gathered from various observatories across a wide spectral range, and fit the aggregate SED with emission and/or absorption spectral models; individual data segments may also be separately analyzed. SED data may be uploaded into the application from IVOA-compliant VOTable and FITS format files, or imported directly from the NASA Extragalactic Database and Italian Space Agency Science Data Center (ASDC); data written in non-native formats may be converted using the SED Builder portion of the tool. Iris can save SED data files in one of the aforementioned supported file formats, as well as files for restoring custom fitting sessions. Iris seamlessly combines key features of several existing astronomical software applications to streamline and enhance the SED analysis process; Sherpa for spectral model fitting, and the NASA Extragalactic Database (NED) and Italian Space Agency Data Center (ASDC) for data access. We strongly encourage you to provide feedback on your experience with the tool by sending your comments, suggestions, and questions to the CXC HelpDesk. Iris: An Extensible Application for Building and Analyzing Spectral Energy Distributions [PDF] : Laurino, Omar; Budynkiewicz, Jamie; D’Abrusco, Raffaele; Bonaventura, N.; Busko, I.; Cresitello-Dittmar, M.; Doe, S.; Ebert, R.; Evans, J.; Norris, P.; Pevunova, O.; Refsdal, B.; Thomas, B.; Thompson, R., 2014, Astronomy & Computing, DOI: 10.1016/j.ascom.2014.07.004. Iris: The VAO SED Application [PDF] : Doe, Stephen; Bonaventura, N.; Busko, I.; D’Abrusco, R.; Cresitello-Dittmar, M.; Ebert, R.; Evans, J.; Laurino, O.; McDowell, J.; Pevunova, O.; Refsdal, B., 2012, ADASS XXI, ASP Conference Series, 461, 893. Constructing and Analyzing Spectral Energy Distributions with the Virtual Observatory [PDF] : Laurino, Omar; Busko, I.; Cresitello-Dittmar, M.; D’Abrusco, R.; Doe, S.; Evans, J.; Pevunova, O.; Norris, P., AAS Meeting #221, #240.38, Jan 2013. Extending Iris: The VAO SED Analysis Tool [PDF] | [PDF (poster)] : Laurino, O.; Busko, I.; Cresitello-Dittmar, M.; D’Abrusco, R.; Doe, S; Evans, J. D.; Pevunova, O., 2013, ADASS XXII, ASP, 475, 295.